I've made no secret of the fact that I don't much care for computer gaming these days. The thing is, that's the only way I played--and enjoyed--games before my brother and I got an NES. First, we used an Apple IIe to play classics like Apple Panic, Miner 2049er, Moon Patrol and The Oregon Trail. Then, we used a Windows PC. 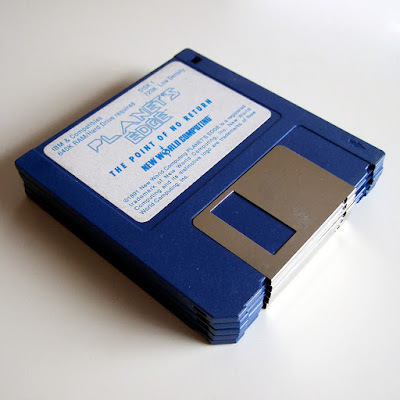 I don't remember the make or model, but I do remember a handful of the games I played on it: The 7th Guest, Day of the Tentacle and Planet's Edge. Of all the above-mentioned titles, Planet's Edge is the one that has stuck with me the most over the years. Curiously, I don't remember why we bought it. I have a feeling my brother read or heard about it somewhere--he was really into sci-fi movies, novels and games back then--and that's what pushed us to pick it up. At any rate, I spent as much time with Planet's Edge as he did--to the point that I'd say it's as responsible as any other game for turning me on to the RPG genre. More importantly, this New World Computing release from 1992 opened my eyes to and made me aware of the joys of resource gathering and mining in a role-playing game. Not that resource gathering and mining is the sole focus of this intergalactic adventure. 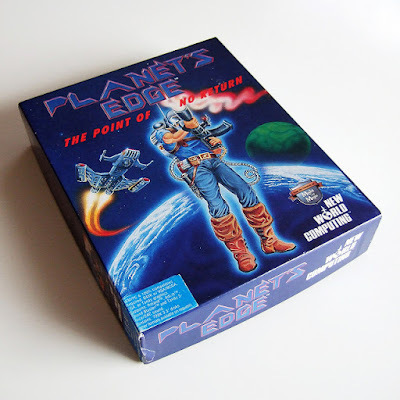 As you work to retrieve Earth from some sort of "wormhole trap" (the planet disappears at the start of the game), you, controlling a four-member crew, also build and pilot spacecraft, battle other ships, investigate the surfaces of far-flung planets, fight their inhabitants and more. To be honest, battles in Planet's Edge can be a pain, especially when it takes place in space. On-the-ground tussles are less aggravating, but only a bit. Thankfully, the annoyances associated with the latter are mostly offset by all of the intriguing loot that's made available to you as you explore the game's many alien outposts. Plus, Planet's Edge does such a great job of fleshing out its expansive world that these missteps are easy enough to overlook--especially if sci-fi settings in RPGs tend to thrill you. That's been the case for me ever since I first booted up Planet's Edge as a teenager, which is why I decided to declare it one of the 10 titles that most shaped my taste in video games. Would I have become a fan of loot-heavy, planet-hopping RPGs had I not stumbled across this one decades ago? Probably, but at the moment I can't come up with a similar title that's had such an indelible impact on me. To this day, I still regularly reminisce about about various aspects of my initial Planet's Edge playthrough. I especially enjoy recalling the excitement I felt when I first touched down on a previously unexplored world, or when I first encountered a rare or unusual resource or material. I doubt I'll ever play this old PC game again, but that's OK with me. My fond memories of it are sure to be better than a second run-through anyway.